In the mid 1990s, I embarked on the first of what would become several world tours of Planet Barbecue to research my first book on live-fire cooking, The Barbecue! Bible. After almost two decades of researching and writing about barbecue, I have come to the conclusion that the best way to cook America's Thanksgiving bird is to use a technique that, like the turkey itself, is also native to the Americas: You guessed it -- barbecue. The first step in the process is brining, which means nothing more than marinating the bird overnight in a mixture of salt, sugar and water. Turkey has inherently dry meat and smoking tends to dry it out further. Thanks to a scientific concept called osmosis, the brine (at least some of it) is absorbed by the meat proteins, adding moistness as well as flavor. And the sugars in the brine encourage browning. The next step is to fire up your outdoor cooker. The options are numerous: offset barrel smokers; upright water smokers; pellet smokers, such as Traeger; kettle and wood-burning grills; even kamado cookers, like the Big Green Egg. If you own a simple charcoal kettle grill, you can smoke a magnificent turkey. Gas grills, unfortunately, do not work well for smoking. Because of the way they're vented, it's hard to get a pronounced smoke flavor—even on a gas grill with a smoker box and dedicated burner. If you want to enjoy a real smoked turkey, you need to cook it with charcoal and wood. Finally, there's the grilling technique -- a method I have come to call smoke-roasting. It's similar to indirect grilling in that both are done next to (or between) the heat sources at a moderate temperature (325 to 350 degrees). What makes it smoke-roasting is the addition of soaked hickory or other hardwood chips to the coals. Don't confuse smoke-roasting with true smoking. The latter refers to a process whereby the bird is cooked at a low temperature (200 to 250 degrees) for a long period (4 to 6 hours or more, depending on the size of the turkey). This is the method practiced by competition barbecuers and it produces a bird of astonishing flavor and tenderness. The bad news is that it produces rubbery, nearly inedible skin, as the cooking temperature isn't high enough to render the fat. The main advantage of smoke-roasting is that it gives you both a smoky flavor and crisp skin. To this add minimal effort: All you need to do is replenish the coals and wood chips every hour. That's about all there is to it. 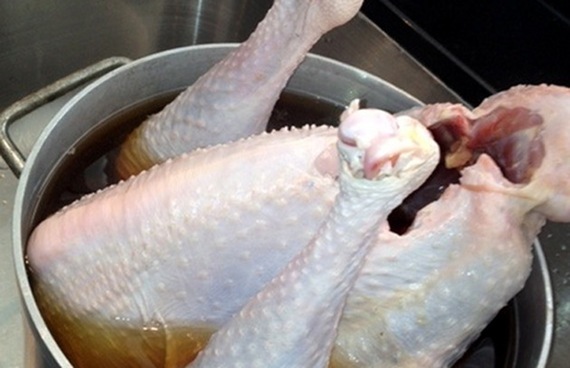 For a beautifully browned turkey, baste the skin with melted butter instead of vegetable oil or olive oil. The milk solids in the butter enhance browning. If you have not already done so, order a heritage bird for your holiday. The two I purchased last year from The Farm Institute on Martha's Vineyard had a phenomenal flavor. Always let the turkey rest, loosely covered with a sheet of foil for 20 to 30 minutes before carving and serving. (This allows the juices to redistribute through the meat.) Note I say loosely. This means draping a sheet of foil over the bird. Do not wrap, swaddle, or tent the bird or the resulting steam will make the skin soggy. Rather than slicing the breast parallel to the breast bone, remove the breast halves, following the rib cage with your knife, then carve them crosswise into slices. This ensures that everyone gets a satisfying piece of white meat and crisp brown skin. Visit a restaurant supply store before the holiday and stock up on take-out containers so you can send your guests home with leftovers. On second thought, save them for making turkey hash the next morning. Get six more tips for giving your bird the most flavor possible. Try out the new technique while you make this Bourbon- and Maple-Brined Smoke-Roasted Turkey for Thanksgiving. Not interested in trying brining? Two alternatives are Beer Can Turkey or a Spit-Roasted Adobo Turkey that gets topped with garlic citrus sauce. GET STEVEN RAICHLEN'S RECIPES HERE!